We’re sure you have your go-to ‘Best of the Beach’ pizza order so ingrained in your head you don’t even have to look at the Ultimate California Pizza menu. Get ready to mix things up next time you dine with us as we introduce you to some hidden gems on our menu that are packed with so much flavor – one of them might become your new go-to order! The Stuffed Mushroom appetizer has quickly become the most popular new app on our menu. This dynamite appetizer consists of fresh mushrooms that are stuffed full with a spinach artichoke blend and topped with hickory smoked crumbled bacon. They may be small – but these these poppable bites are bursting with flavor and sure to disappear as soon as they reach the table! You thought you’ve had the best of the pizza that pleases everyone – but you haven’t tasted the San Francisco Pizza yet! Like all of our ‘Best of the Beach’ pizzas, we start with our made from scratch dough and ultimate red sauce – which is a special recipe that consists of vine ripened tomatoes from our special farm in California mixed with a special blend of herbs and spices. Our San Francisco pizza is then topped with sauteed mushrooms, green peppers, yellow onions, and juicy tomatoes! Then we add Monterey Jack cheese and USDA choice New York strip for an explosion of taste that’s so good – you won’t be able to have just one slice! If you’re craving something other than pizza, try one of our favorites – the Polynesian sandwich – for something light and fresh! This sandwich has roasted teriyaki chicken, sweet golden pineapple, Swiss cheese, hickory smoked crumbled bacon, lettuce, tomatoes, and red onions! The Polynesian sandwich creates a sweet and savory combination that makes for a flavorful meal! What are you waiting for? 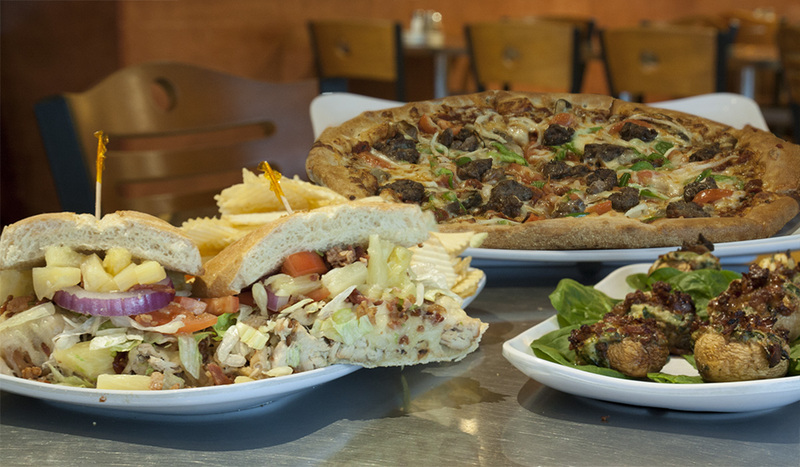 Come see us at one of our six Ultimate California Pizza locations around Myrtle Beach. Not feeling like dining in but still craving a handcrafted pizza? We offer carryout and delivery options as well!